What follows is a simple yet comprehensive guide for the individual looking to shoot their handguns more accurately. The following approach was designed to allow someone with little or no experience in firearms to shoot an FBI qualifier and pass it with the first 60 rounds they fire. Using the next steps will allow you too easily get to an intermediate level of skill with minimum expenditure. I firmly recommend that you follow these steps in order to get the most benefit from them. Safety rules are always important when practicing firearms training and carry. The most important rule is, all guns are always loaded, treat all firearms as potentially deadly weapons at all times. Loaded or not, always ensure the muzzle is pointed in a safe direction. If you forget one of these rules and remember the other, there will be no injury or major damage to property. Next, we start with the training. Again, I suggest taking each step in order to get the most benefit from this approach. 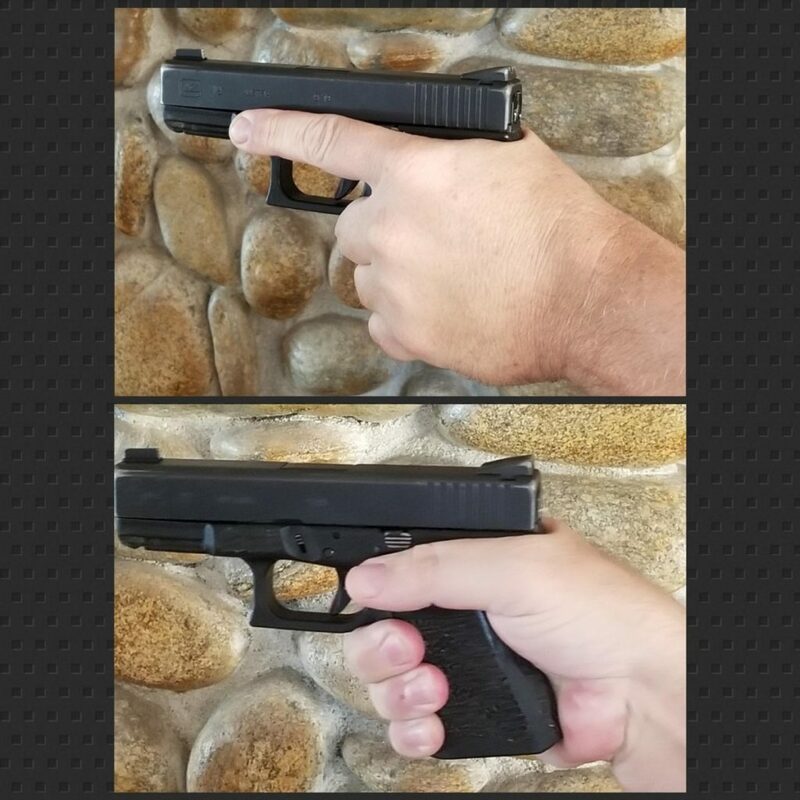 Dominant eye/hand check: The dominant eye/hand is the hand that manipulates the trigger, and the support hand is the hand that supports the firearm, draws magazines, and clears concealing garments. Your dominant eye and hand may, in fact, be different than the one you have been raised to use for writing and simple manipulations. Start of a proper grip for better accuracy. Most people have a dominant eye/hand, however, some people are cross dominant, and yet others have a dominant eye but shoot better with their other hand! The easiest approach is to put your hands together making and open diamond with index fingers and thumbs below. You should be able to see through the hole completely. Facing a single small object 10-15 yards away (I use light switches when indoors and targets when at the range) extend your arms straight out in front of you with BOTH eyes open. Center the object inside of the diamond hole, then alternate closing each eye in turn, one side should maintain centered status and the other should have no visibility. The side that maintains centered status of the object is the dominant eye. With most people, the hand on that side will also be dominant. Again, this does not always apply. It is, however, a good enough approach to allow you to learn which side is dominant. Understand that learning to shoot with both sides well is essential, however, for the purposes of this article the most important aspect is finding your strong side. A proper hold of the firearm is the next step. Dominant hand should be firmly seated with the webbing of the hand tight under the curve at the top of the grip. The meat of the palm should be towards the back of the grip because it is important to maintain as much skin-on-grip contact as possible. With the index finger laying along the frame above the trigger guard, the bottom three fingers should wrap tightly under the trigger guard, firmly touching the bottom of the trigger guard and tightly clasping the grip. You can crook your index finger slightly to gain just a bit more stability, but always keep the finger on the frame when not shooting! This is a habit that will prevent accidental discharges under stress. The thumb can be pointed up or alongside the frame opposite the index finger. I suggest keeping the thumb pointed down to prevent slide bite. Slide bite occurs when the thumb is too high and the slide runs across it when firing, this is painful and will cause bleeding. Next, the support hand should be placed with the meat of the hand (between the thumb and pinky south of the fingertips) in the gap on the frame between the fingertips and base of the dominant hand. Wrap all four fingers around the front and underneath the trigger guard again, firmly placing them against the underside of the trigger guard and wrapped over the three bottom fingers of the dominant hand. The support thumb should be under the dominant thumb. It is important not to cross these digits as this will not aid in creating a firm stable platform. Make sure you use a crushed grip, this is a firm grip that leaves your fingertips just slightly white and should have more “crush” coming from the support hand! If you follow this approach it will provide you with a strong, stable platform for accurate shooting. Drawing the firearm is the next step in learning to shoot straight and well. We can start with the concealed carry draw. Here is the basic approach which easily applies to any on-body concealed carry. Using these basics for drawing you can with a small amount of practice learn to draw and fire and through use of stable basics easily be on target regardless sight picture. The result is better combat accuracy and ability under duress. Remember that fine motor skills and endless lists of approaches can cause confusion. Keep it simple, stupid! Drawing from open carry uses the same basic motions, without the clothing grab, using the non-dominant or support hand. The following steps from the concealed carry draw apply directly to carrying while open carrying. Place your support hand with a closed fist directly over your breastbone. This allows you to maintain a mechanically sound grip on the handgun if you choose to only use one hand while firing, and allows for an easy transition if you decide to use both hands. Remove your support hand from the front of your body and come down or up to meet your dominant hand and firearm. This step can be before you rotate or during, however, it is in this place because it is easiest to remember. Once you have discharged the firearm at a threat, a target, or while dry firing carefully remove your support hand while maintaining the safe direction with the firearm close to the body and aimed forward. Now we can look at shooting stances, these are important to understand, some schools only teach one approach, while I suggest learning all of them and adapting that one that best fits your style and shooting ability. Here are the top three stances for shooting a handgun, all of them can be easily adapted to fit your approach, and for the use of a rifle for combat applications. For myself, this means keeping all of my rounds within a 2-4” circle at 0-25 yards with a handgun, regardless of speed. Anything larger than 4” will mean misses when under pressure. When under pressure the human body and brain tend to shut down small adjustments in favor of large life-saving movements. This means that someone who can shoot 8-15 rounds inside of a 9” circle at 10 yards will likely see upwards of 18” at best. My suggestion is always to shoot as small as possible, which means slowing down and learning to crawl before you walk, and eventually run. The best fast shooting I have ever done saw split times of 0.17 seconds and all rounds inside of 4” at 7-15 yards with different locations and movement required between all. This means that if a 15 round magazine was expended in 10.2 seconds with draw, it was a 11.5-second run total. This is abnormal for me, I shoot closer to 0.25-second splits (splits are the times between shots fired) and under 4” normally. This is my comfort zone and I am very comfortable in this area. I would suggest the following books for the novice through advanced shooter with regards to sight acquisition and shooting. The following books have been linked as well. Massad Ayoobs’ “Stressfire” and Colonel Jeff Cooper “Cooper on Handguns” lastly Rex Applegates’ “Bullseyes dont shoot back!”. All of these books work with basics of shooting and application to defensive approaches. Some of the terms and approaches are outdated but the basics are absolutely essential to understand and apply regularly. Handgun sights come generally in one flavor, a front sight post that is centered between a rear sight notch for firing. How you use the sights and hold the handgun directly affects your ability to put rounds on target in an aimed controlled manner. There are some handguns with oddly shaped sights, and there are red dots that can be mounted now as well. However, your accuracy will not improve using any of these alternatives unless you apply the basics up front! Practice using the sights in a controlled, slow enough to be accurate, manner. Everything else is a result of solid basic knowledge, learned and applied well. There are a couple of approaches to shooting without the full use of sights. For close personal protection (under 15 yards) stress fire indexing or point shooting, as it is known and applied by some. There is a difference between the two styles, though it is not very large in practice. Stress fire indexing was designed and originated by Massad Ayoob a premier handgun legalities and shooting instructor who is very talented in his own right. It is defined as focusing on the target while looking over the top of the gun in a way that allows you to see the blade of the front sight standing above the rear sight notch by ½ or 2/3rds of the height of the front sight post. The idea with this is that you are indexing the front sight against the target. This allows a much faster engagement when speed is needed. What it does not allow is pinpoint accuracy, without large amounts of practice. Point shooting was formulated as an approach by Rex Applegate, Fairburn, and Sykes. There are other approaches to it with names like Center Axis Relock and there are slight differences among them all. The FAS or Fairburn, Applegate, Sykes approach is quite simple and the others are derived from this approach. To accomplish the FAS approach you draw the handgun as outlined above and keeping the arm and handgun at a low ready lock the wrist and elbow firing using your index finger or an alternative approach is keeping the index finger along the frame and firing using the middle finger while “pointing” at the target with the index finger. If you are not comfortable practicing these techniques than use an alternative approach, this incorporates the draw found above with your preferred sighting method. Using the sights of the handgun you have two approaches that can be used, the 6 o’clock hold and the center hold. With an unloaded handgun hold it firmly as described above, look down the top of the handgun and center the front sight in the rear notch. The 6 o’clock hold is when you place the target directly on top of the sights. The center hold is placing the sights halfway on the target. I personally prefer the 6 o’clock hold as it allows better vision of the target which is important. Many modern handguns come with sights designed for this hold. It is important to note that there are some that come with a center hold designed into them. All good modern defensive handguns have quality aftermarket sights available for all hold types. I would suggest that when sighting you focus on the front sight and target and allow the rear notch to blur slightly. This approach will allow for faster target acquisition and engagement with moderate to fast speed while placing shots in a more precise manner. Practice using slow fire until your accuracy catches up to your speed. As stated above, fire slowly enough to hit the target accurately. One should strive for smooth, accurate, speed of engagement when shooting and practicing to shoot defensively. If at all possible film yourself when dry firing or live fire. Film from the side so that you can see the entire body, this is essential and ensures that you will see areas for improvement and what you are doing right. If you have access to a range engage with others and those who shoot handguns well. Small groups, varying distances, be friendly and ask for help. Going to the range as a new shooter (sic., any shooter) and bragging about your exploits is rarely a beneficial approach. Rather, it is in your best interests to be willing to accept criticism and help when shooting. Even if the help is not necessary you may learn beneficial things for your personal library. I have been shooting actively for over 35 years, with advanced training and have personally taught well over 1000 students, not including assisting other instructors with their students. I share this information because in my experience I have learned far more by being open to alternative ideas from individuals I may not like personally or agree with than by shutting down or dismissing anything I do not immediately agree with. Shooting the firearm is the last step in the process of learning “How to Shoot a Pistol More Accurately.” I do suggest using your state’s POST qualification test, or the FBI qualification shoot test, to gauge your shooting ability. Additionally, I would suggest using the pistol correction chart to adjust your shooting as needed. POST stands for Peace Officer Standards and Training. Every state has a POST qualification test, and while some states are extremely quiet about it and will not release it publicly, many states have theirs readily available including target types used. My preferred qualification test is the FBI qualification test, my reasoning is legal in nature. If you are able to prove that your abilities are good enough for FBI work, this is a potentially positive thing legally. Whichever law enforcement qualifier you use make sure you document your training with it. Have two witnesses sign the target and fill in date, time and save the target along with any training certificates you may have received. All of these may be important legally if you ever have to use your firearm in self-defense. Always be smart and remember, shoot as slowly as needed to hit accurately! While this section does not directly relate to shooting accurately, it should be noted that the author strongly encourages your studying of the laws regarding self-defense in your location, and if necessary speaking with local attorneys who have defended self-defense cases! There is much information on legal approaches available online, my suggestion is to follow a simple approach. All rounds fired have a lawyer attached. This means every round fired has the potential to lead to legal liability, and the need for a lawyer. Never shoot unless it is the last option you have available. Always be alert and aware of your surroundings – situational awareness. Train, train, and train more! Remember the basics shown above, practice them regularly with dedicated, safe, dry-fire practice. If you can afford the time and ammunition, actively train on a live range. Static ranges work very well for increasing your accuracy and manipulation ability. The drawback with static ranges is the inability to move around as needed for defensive training. Once you are familiar and comfortable with your accuracy and ability on a static range you need to work on movement while shooting. Using a range that allows safe movement, maintain muzzle awareness, and practice the basics – moving to the side, off the X. This means that you slide your outside foot away from your current position while maintaining solid muzzle awareness, and even aim towards the threat, then bring your support foot in by sliding it back into a stable shooting stance. Do this so that your entire body moves one body-width sideways off of the X-axis you originally started in. This approach will allow you to prevent more injury to self and will cause the attacker to hesitate while they try to figure out where you went. Lastly, the handgun and ammunition used are extremely important aspects of accurate shooting. You will find that matching ammunition to your handgun for the best accuracy results is a tedious process. I have found that some ammunition types work best with some handguns. This does not mean you should not test the combinations yourself. Use self-defense ammunition for your defensive handgun, full metal jacket or round nose ammunition is NOT self-defense rated or tested. There is a reason most law enforcement agencies use good self-defense ammunition. My two top choices for self-defense ammunition are Speer Gold Dot and Federal HST. There are others that may work better with your caliber and handgun choice, however, of all the types I have tested these have the most consistent overall performance. You will also want to ensure that your handgun is properly sighted in. While some handguns sold come from the factory already sighted in, in most cases you will need minor adjustments. If your zero is off by as little as 1 inch at 3 yards it will be off by up too 12 inches at 25 yards. This means that a small variation can easily mean you are hitting everything except your target. Sight your firearm in properly. Be sure to ask in the comments if you would like an article regarding sighting in a firearm. As always thank you for reading this article, and if you believe I may have left something out feel free to let me know in the comments. I am someone who enjoys critical feedback and will gladly admit to mistakes when made. Thank you for reading!